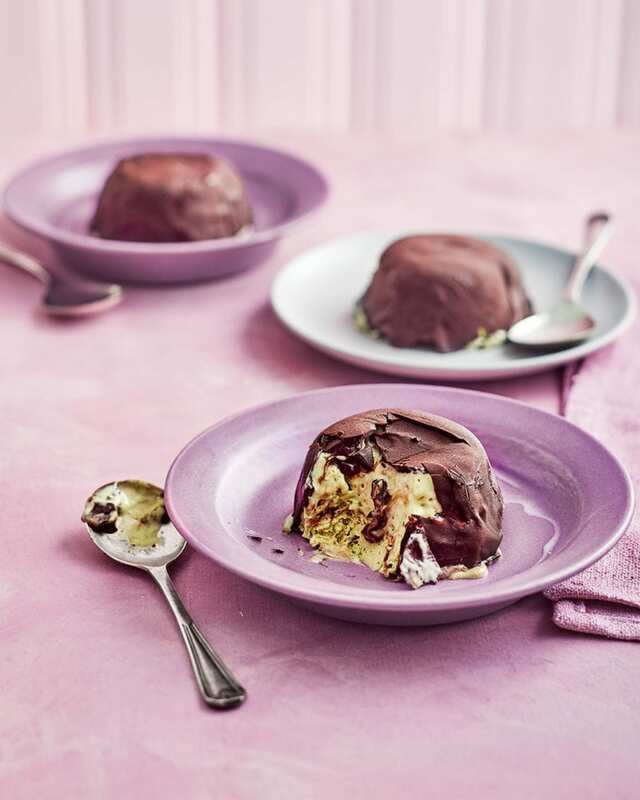 Create a showstopper dessert for your next dinner party with these impressive ice cream bombes; crack open the chocolate shells to reveal a gorgeous homemade mint chocolate ice cream. Put the cream and chopped mint in a heavy-based saucepan and heat gently until just boiling. Transfer to a blender, then whizz until smooth and bright green. Put a sieve over the pan and strain the mixture back into the pan (discard the solids in the sieve). Return to a low heat and keep warm. Put the egg yolks in a large heatproof mixing bowl, then whisk in 50g caster sugar and the cornflour. Pour the warm cream slowly over the yolk mixture, whisking constantly, then strain through a sieve back into the cleaned pan. Return to the heat and stir until thickened, then strain once more into a clean heatproof bowl. Leave the custard to cool with a sheet of cling film touching the surface to prevent a skin forming, then chill. Once the custard has chilled, taste and add 5-10 drops of mint extract (see tips). In a large clean bowl, using an electric hand mixer, whisk the egg whites until stiff peaks form when the beaters are removed. Whisk in the remaining 150g sugar a tablespoon at a time until the mixture is smooth and glossy. Stir a large spoonful of the whisked egg white into the custard mixture to loosen it then, using a large metal spoon, quickly fold in the rest using a figure-of-eight motion. Drizzle about 100ml of the chocolate sauce over the mixture and fold in quickly for a marbled effect. Divide half the ice cream mixture equally among the moulds, dot another 1 tsp chocolate sauce in the middle of each, then fill with the remaining mixture. Cover each mould with a few layers of cling film and freeze for 6 hours or until solid. Once frozen solid, remove the dariole moulds from the freezer, boil the kettle and pour some of the water into a small heatproof bowl. Dip the base of each mould in the hot water for 2-3 seconds, then turn over and put on a plate. Tap firmly on the bottom to release the bombe. Run a dinner knife around the edge of the parfait if you’re having difficulty turning them out. Working quickly, put all the bombes on a wire rack set over a sheet of baking paper. Carefully pour the melted chocolate over the top of each bombe to completely coat in a thin layer, then return to the freezer for at least 1-2 hours until set, or until ready to serve (see make ahead). We used Spice Drops mint extract, available from amazon.co.uk or Ocado. If you can’t find it, use any good quality mint extract. Make the parfaits to the end of step 4 up to 2 weeks ahead. Finish the recipe to serve. Once you’ve covered them with chocolate, eat within a day to prevent the surface of the chocolate from blooming (turning white).